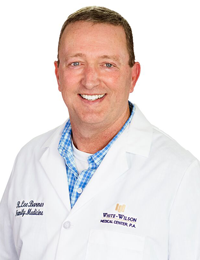 R. Lee Barnes, M.D., MPH, is a board-certified family medicine physician practicing at the White-Wilson Family Medicine Clinics in Niceville and Fort Walton Beach. He received his medical doctor degree from the University of Illinois College of Medicine in Peoria, IL, and completed his residency training at the SIU Family Medicine Residency Program. Dr. Barnes has been practicing medicine since 1997. Dr. Barnes is board-certified by the American Board of Family Medicine and specializes in treatment of blood pressure, cholesterol, preventive care, physicals, wellness exams, urgent care illnesses, chronic illnesses, and minor skin surgical procedures (such as biopsies, lesion destruction, etc.). Dr. Barnes is committed to providing comprehensive, efficient and compassionate primary care. From the time he was young, he was interested in medicine and enjoys the variety of care he can provide as a family medicine physician. He believes in listening to his patients, and partnering with them in their overall care. When he is not practicing medicine, Dr. Barnes enjoys fishing, target shooting and time with his family. He is a self-professed nerd, and that's ok because he has a great sense of humor!